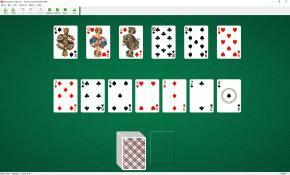 Reverse Order Solitaire uses 104 cards (2 decks). You have 13 foundation piles. One card of each rank is dealt to foundation piles at the start of the game. A King is dealt to the first pile, A Queen - to the second pile,...., An Ace - to the last, 13th pile. To build the foundations down ,regardless of suits, until the layout is reversed, i.e. top card of the first pile is an Ace and the top card of the last pile is a King. Keep in mind that a different number of cards should be moved to each foundation pile to complete it. The top card of the waste pile is available to play on foundations. Turn cards over from the stock pile to the waste pile.